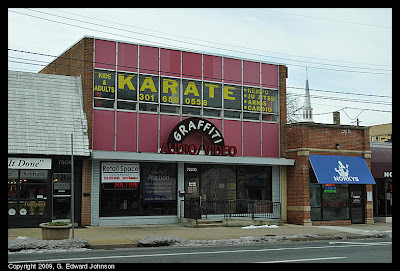 Graffiti Audio and Video, a long time Bethesda, MD fixture has closed. This is the store that had the Blues Brothers statues out front. The remaining merchandise is being auctioned off online at rasmus.com. The snow stopped Saturday night. 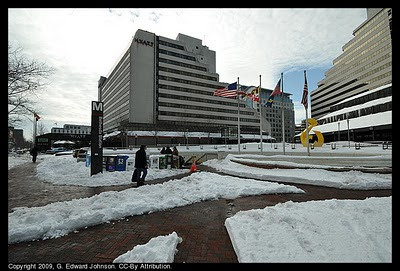 I waited until midday Monday to walk around downtown Bethesda, MD and see how it held up. 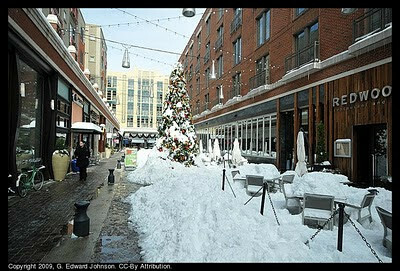 Bethesda has a reputation for being a good place to walk around, a big snow storm is the perfect time to put this to the test. 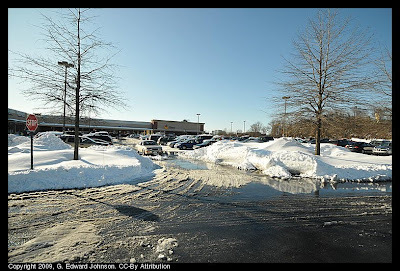 90% of the sidewalks were at least mostly shoveled, you would now and then come across one or two stores that hadn't shoveled (unfortunately, some of them were on Arlington Rd which is pretty major). 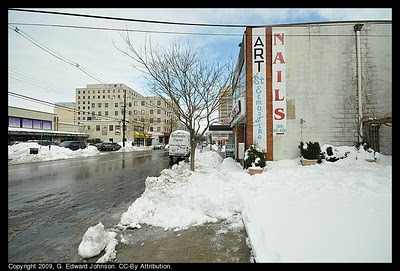 Intersections and curb cuts were pretty hit and miss, lots of them had been poorly cleared or not cleared at all. 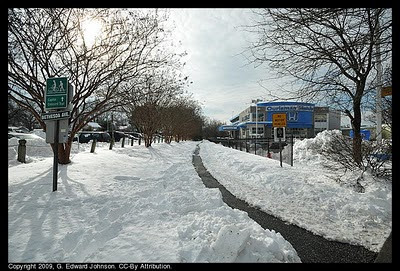 Dear Bethesda, learn how to shovel sidewalks. It's not that tough. 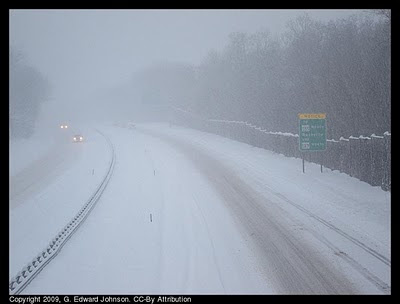 Also, plow more than one lane on the major roads. That would be great. Old Georgetown Road and parts of Wisconsin Avenue were missing lanes. Particularly noticeable was Old Georgetown between Arlington Rd and Woodmont Ave (southbound) only one lane of two was clear, backing up traffic. 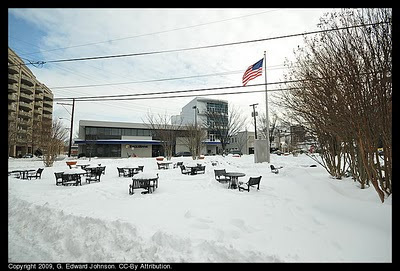 Veteran's Park was just tables in a field of snow, no chance of walking through there. The Capital Crescent Trail was actually a bright spot. There was a narrow path cleared going down towards DC. I didn't follow it to see how far down it was cleared. I'll give the cleanup a B- because it really should have been better by now. I went easy on them because it was such a large storm. At the top of Bethesda Metro station is a line of newspaper racks. 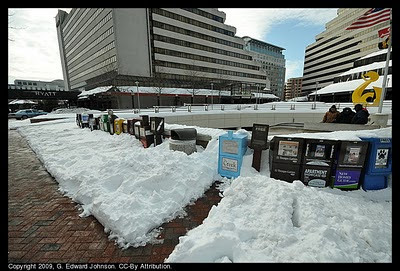 They all had about four feet of snow in front of them and none had been refilled, not even the USA Today and Washington Post. The lone exception was the Rock Creek Free Press which had not only been refilled, it had a path shoveled to it. If you have never read it, grab a copy one day, its free. One spot that did give me a pause was this store. 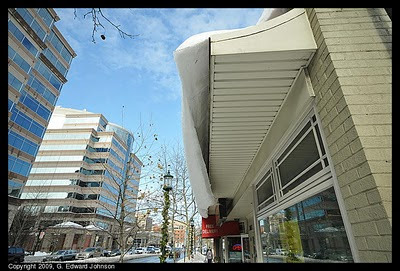 The snow was slowly sliding off the roof and was hanging over the sidewalk. Look up while you are walking too. Officially we got 24 inches of snow here in Bethesda, MD. There were 17 inches piled up on my patio table. It snowed hard from about 9pm Friday night until around 9pm Saturday night. During the snowstorm the roads were in pretty poor condition, not surprising since it was snowing at the rate of 1 to 2 inches an hour. Here is a picture of I-495 near Old Georgetown Road. Even with conditions like this, there were still people driving. No one was spared, not even the police. By Sunday afternoon, things were much better. Main roads and secondary roads were wet, side streets were a bit worse, and they had started plowing neighborhood streets. I was just a tiny bit disappointed by how quickly things got back to normal. They were busy re-stocking shelves at the Giant Food on Old Georgetown Rd. Nothing was really out, but selection of a few things were limited. For instance, there were no cans or 6 packs of Diet Coke, only 2 liter bottles. 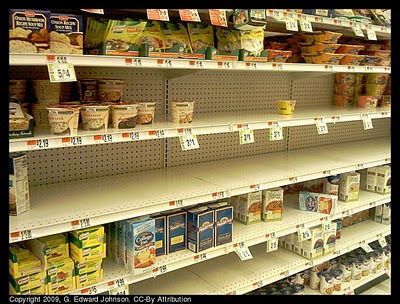 The soup aisle also had some holes in it. 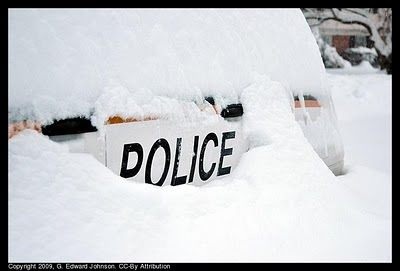 Tell us what you did during the snow storm. 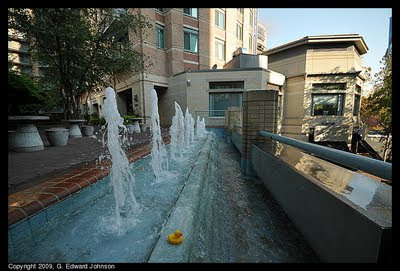 Nestled between Chipotle and Crossfire Grill, on the corner of Old Georgetown Road and Commerce Lane in Bethesda, MD is this fountain is easy to miss even though it is two stories tall. 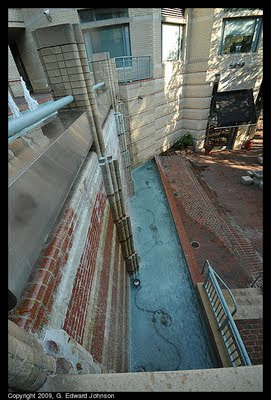 The top has a series of water spouts then the water flows down a brick wall to a pool. At the top of the fountain are a number of quiet tables that are usually empty. At the bottom are more tables that are quite crowded on nice days with people eating lunch (at lunchtime) or kids hanging out after school. A staircase alongside the fountain lets you access both parts. 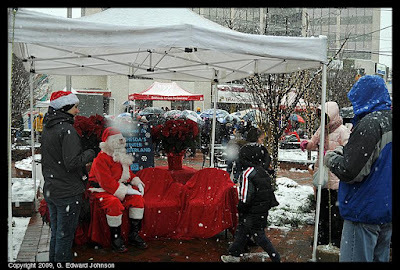 Last Saturday was the "Bethesda's Winter Wonderland" event with an ice sculpture carving, student concerts and even a visit from Santa Claus. I didn't get there in time to see if they used a chainsaw on the ice, but I enjoyed watching the sculpture putting on the finishing touches. It was in the shape of a giant snowflake. After that, they had five different schools singing carols (one after another, not all at once). I stayed for the first two (Our Lady of Lourdes and St. Jane de Chantal) before the cold chased me off to get hot chocolate. 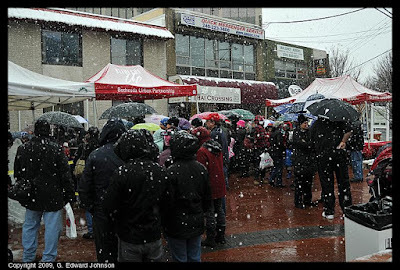 Veteran's Park was filled with people and there (mostly kids who were going to sing and their parents), it was great having the event while it was snowing, and the singing was good too. After last year's disappointing snows, I am very excited about this year. An early snow always puts me in good spirits. 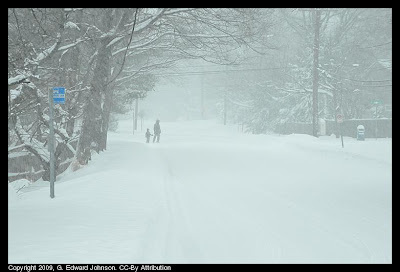 This morning in Bethesda, MD the rain changed over to really big snowflakes that started blanketing the ground. Now the flakes are smaller but are still coming down. We have an inch or two of snow on the ground. Roads are wet with a little slush in turn lanes. Nothing too bad but take it a bit slower, I did slide when trying to stop for a red light on Democracy Blvd (near where this picture was taken). 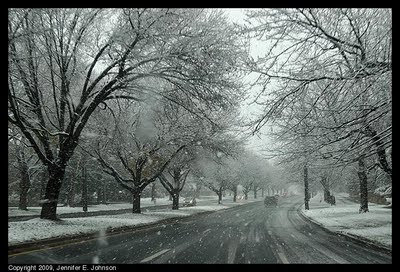 It is above freezing so I don't think that the roads will get bad, and an early snow like this won't stay around long. It is supposed to keep snowing this afternoon and tonight but tomorrow will be around 40 so it should all melt. Montgomery Avenue at Wisconsin Avenue is currently closed. One lane of Northbound Wisconsin Ave is also closed. There are lots of fire trucks in the area and activity seems to be centered around the building across the street from the police station. I didn't see any sign of an actual fire. Update 2:15pm: Montgomery Ave is now opened, it looks like all police/fire/rescue have cleared out. 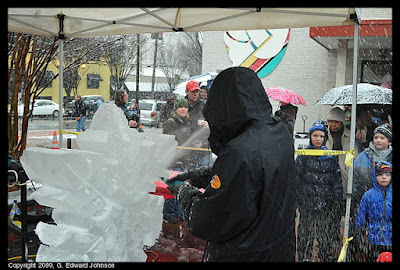 This Saturday from 1 to 2pm watch live Ice Sculpting presentations in Veteran's Park in downtown Bethesda. Watch as large blocks of ice are carved into beautiful sculptures. (This often involves chainsaws and chips of ice flying everywhere. You know, good, wholesome fun). After that, there will be a student concert with holiday music from featuring Garrett Park Elementary School, Our Lady of Lourdes, Seneca Valley High School and St. Jane de Chantal. Veteran's park is on the corner of Woodmont Ave and Norfolk Ave. Ice carving starts at 2pm the student concerts start at 2pm. More information at Bethesda.org. Update December 9: I went to this event, you can read my report. I ran across an interesting site the other day, the Lost Cat Neigbourhood Watch. You can sign up to get an email when someone looses their cat in your neighborhood. Or, let's say you loose your cat, you can post it on this website, along with pictures, descriptions and location and other people in the area get an email and can report if they have seen or found your cat. As an example, today someone from Potomac, MD lost their cat Kesha, I hope they find her. I should have posted this last week, but on Wednesday December 2nd there is a public meeting to discuss the planned improvements to sidewalks and bikeways on Seven Locks Road between Montrose Rd and Bradley Blvd. It is from 6-9 pm at the Heights School, Chesterton Hall, 10400 Seven Locks Road, in Potomac, MD. You can read the (sparse) Meeting announcement or spend time perusing the much more interesting Project Documents. Two 11 foot wide travel lanes plus a 5 foot wide on-road bike lane on each side of the road. A 8 foot off-road shared use bike path on the west side of Seven Locks Rd. A 5 foot wide sidewalk on the east side of the road. A 8 foot off-road shared use path along Montrose Rd between Seven Locks and I-270. Northbound and eastbound auxiliary through lanes at the intersection of Seven Locks and Turkerman Ln.